As an archipelago with over 6,800 islands, to call Japan an incredible beach escape would be an understatement. From the towering resorts overlooking the white shores of Okinawa to the cozy accommodations near the surf-ready waves of Chiba, there are no shortage of stunning beaches and equally incredible resorts to explore in Japan. Okinawa’s tropical island Ishigaki is rapidly becoming one of Japan’s most popular holiday destinations with both local and international guests. Although the picturesque island is only 140 kilometers around and 222 square kilometers in total, the island packs a lot into such a small space. Boasting rugged mountain ranges, pure blue water, and pearly white sand it’s the ideal place to escape the world if only just for a few days. With its rise in popularity has come a wave of stunning high-end beachside resorts. 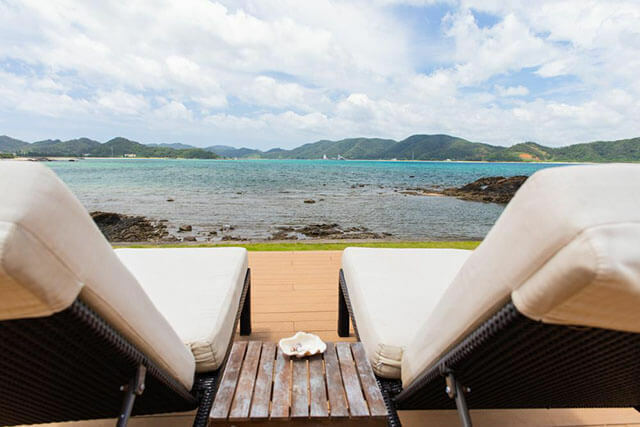 For those who prioritize luxury above all else, you can’t look past Grandvrio Resort Ishigakijima Villa Garden. Featuring towering palm trees, a stunning beach view, and plenty of space along the oversized pool to admire the long, sweeping sunsets, a stay at this Villa Garden is one you won’t forget. If you’re looking for a destination that feels like a secret, then look towards the Amami archipelago. A cluster of small white sand islands sitting between Kyushu to the north and Okinawa to the south, the Amami archipelago has plenty of stunning blue gems, but a highlight is arguably Yoron, the third smallest and southernmost island in the chain. With untamed lush green foliage, almost impossibly white shores, and a language unique to the island, Yoron boasts a culture unlike any other you’ll experience in Japan. One of the best places to stay on the island is Pricia Resort Yoron. Situated on the western shore, this upscale apartment complex offers all the luxuries you could imagine; a pool, beauty services, spa facilities; sports, sports and recreation, and restaurants serving local and international cuisine. Truly a remote paradise. 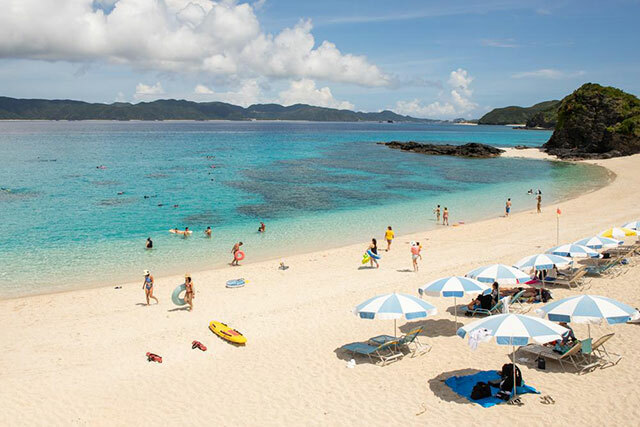 Three hundred kilometers south of Okinawa’s main island, Miyako Island is internationally recognized as being home to some of the nation's best beaches. 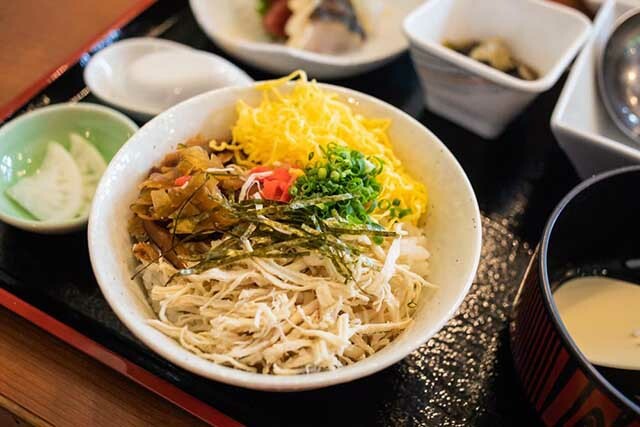 The island’s deliciously warm subtropical climate remains a constant practically year-round making it the perfect summer-style escape no matter the season on mainland Japan. Home to ample watersports opportunities, like snorkeling and scuba diving, as well as boasting its fair share of scenic viewpoints, like Makiyama Observation Deck it’s impossible not to fall in love with this postcard-perfect island. When you come to explore, one of the best places to set up a home base is Hotel Locus, a sleek, stylish hotel with retail outlets, restaurants, sports facilities and incredible ocean views. A little closer to the main island in the Seto Inland sea between Honshu and Shikoku sits Awaji Island, an oft-overlooked island destination practically overflowing with incredible history and stunning natural views. 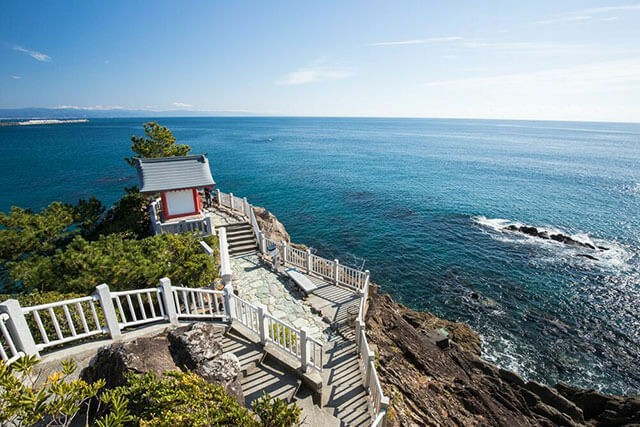 Sometimes referred to as the Hawaii of Hyogo by the locals, it’s only two hours from Osaka making it the perfect summer city escape. One excellent resort worth staying at is Westin Awaji Island Resort and Conference Center. It’s centrally located, offering easy access to the area’s major attractions like Akashi Kaikyo Bridge and Mitsui Outlet Park Marine Pia Kobe mall. But do be warned, with its ocean views, world-class amenities and meticulously manicured, picture perfect gardens Westin Awaji Island Resort will be difficult to leave. 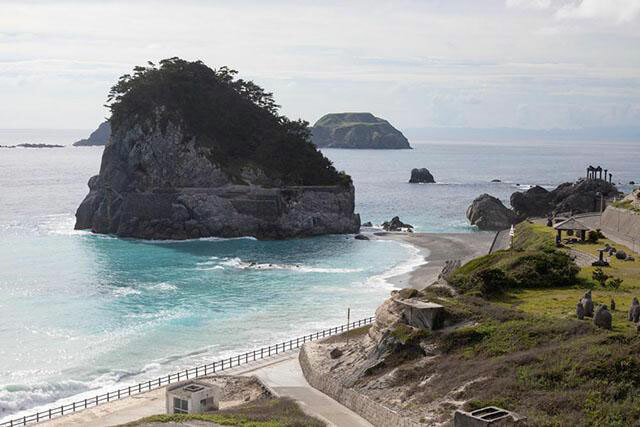 One for the surfers, Niijima sits just a few hours north of Tokyo and offers some of the best waves in the country. If you’re looking for an accessible mini-vacation with picture-perfect beaches and ample water sports facilities but don’t want to head too far from the city, be sure to add this one to your itinerary. It’s still not a super well known international tourist destination but boasts some attractive resorts. Once recommended option is Niijima-mura Onsen Lodge located on the water just southeast of Habushiura Park. A little more low key than other beach resorts, this cozy hotel has western and Japanese style rooms as well as excellent onsen facilities, perfect for soaking those aching muscles after a long day carving up the waves. Floating in the stunning East China Sea, the Goto Islands of Nagasaki Prefecture are a criminally underrated beach destination, perfect for both the long, romantic summer escape or just a few days of adventure with the family. One top resort choice on Goto Islands is Margherita Goto Islands Resort Hotel. Only five kilometers from the popular historic destination, Aogasaura Catholic Church, the resort has ocean views, spacious open plan rooms, and a kitchen that serves up excellent Japanese and international cuisine. Perched on the southern tip of the Boso Peninsula in Chiba Prefecture, Tateyama is another Tokyo-accessible beachy escape, popular with city day trippers and water sports enthusiasts. Here you’ll find plenty of opportunities to try a little fishing, snorkeling, and scuba diving by the rocky coastline, as well as a broad selection of beach resorts. If you’re having difficulting choosing where to stay, consider Uminoyuyado Hanashibuki Hotel, situated at the south of the Boso Peninsula, right by the sea of Tateyama Bay. With its Japanese-style guest rooms, it has the cozy charm of a classic ryokan inn, complete with open-air hot spring baths and banquet-style dinners. Thirty kilometers west of Naha City, in Okinawa, sits Zamami Island, it’s part of the Kerama Islands archipelago, an is a relatively remote island with unparalleled ocean views. There are two main beaches, Furuzamami Beach, and Ama Beach both with crystal clear waters, perfect for snorkeling and scuba diving. Practically untouched by large scale tourism, it feels like a remote island secret.